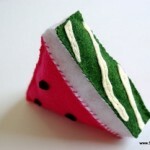 Be sure to check out the beautiful basket of felt food pictured at the bottom of this post. Natural Parents Network and Mama’s Felt Cafe are giving away an identical basket! 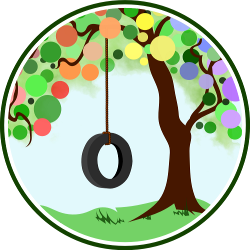 Visit the review/giveaway post and enter today. Ah, sweet June. After a blustery, stormy, wet May at my house, I’m ready to embrace the sunshine and warm weather. June also means the return of the summer Farmers Markets and fresh, local produce to our table. 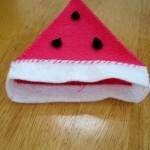 This post will focus on a particular fruit favorite of mine — the watermelon. The few nights before my son was born, I was up with sporadic contractions for hours. In the dark of early morning, I would sneak downstairs and eat cool, refreshing watermelon slices, ravenous from the pre-labor work. Since then, watermelon has a special place in my heart. Here is a tutorial to keep this delicious summer food around all year long. 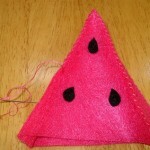 First, sew all the seeds to both of the triangle pieces. I just did an “X” stitch through the seeds. 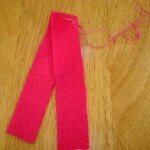 Next, sew your two pink side pieces together using a whip stitch. 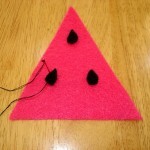 Working from the point of the triangle, sew down the first side piece to one of the triangle sides. Then, sew down the second side piece. 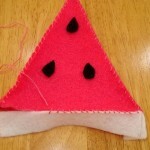 Next, flip the watermelon over and sew the second triangle piece to the other side of pink side pieces. Now, on to the white rind pieces. 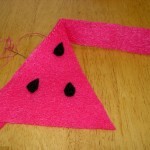 Start by sewing one of the white square pieces to the pink side piece. 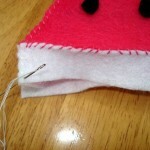 Be sure to use contrasting thread that matches your watermelon color for this part. 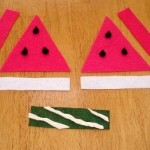 Then, sew one of the long white pieces to the long side of the triangle piece. 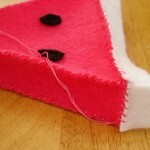 Keep moving along, sewing the second white square to the other side of the watermelon. 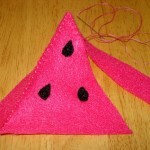 Attach the last long white piece to the triangle piece. Now, using white thread, sew all the corners of the white rind pieces together. 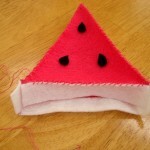 Here is our watermelon so far, with all the rind corners sewn. Almost done! 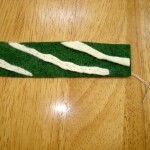 Using a back stitch, sew the cream felt pieces to the green rind piece. 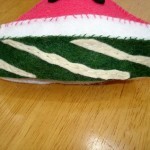 Add stuffing to the watermelon. 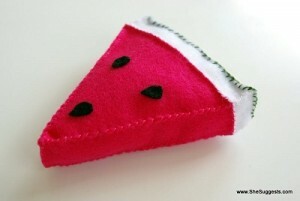 Be careful not to over-stuff, or the watermelon slice will look a little bloated. Finally, sew the bottom rind piece to the white rind pieces. Use a green thread to match the green rind. 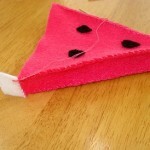 Our delicious watermelon slice is now complete! beets, potatoes, pea pods, banana, and pineapple slices for more felt fruit and veggie ideas. 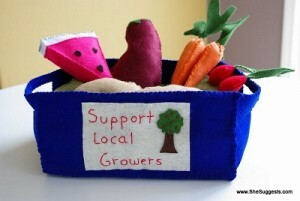 Isn’t this basket of felt food beautiful?! Be sure to check out NPN’s review and giveaway of this very same basket, generously donated by Brittany at Mama’s Felt Cafe. Mama’s Felt Cafe is run by Brittany, a stay-at-home mom to her son Asher. When she’s not busy sewing, Brittany practices attachment parenting, and she’s a big fan of homebirth, breastfeeding, co-sleeping, toddler wearing, Elimination Communication, and cloth diapering (when not ECing). 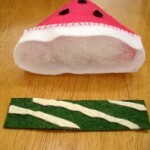 Visit her blog and her Etsy shop for more yummy felt goodness! Love this. I’m going to make it as soon as my order of felt comes through! Brittany, you certainly do outline how to make your own felt friends very simply. Visiting your Etsy shop is definitely worth while also; you offer these handmade creations for very reasonable prices, IMO. Thank you!